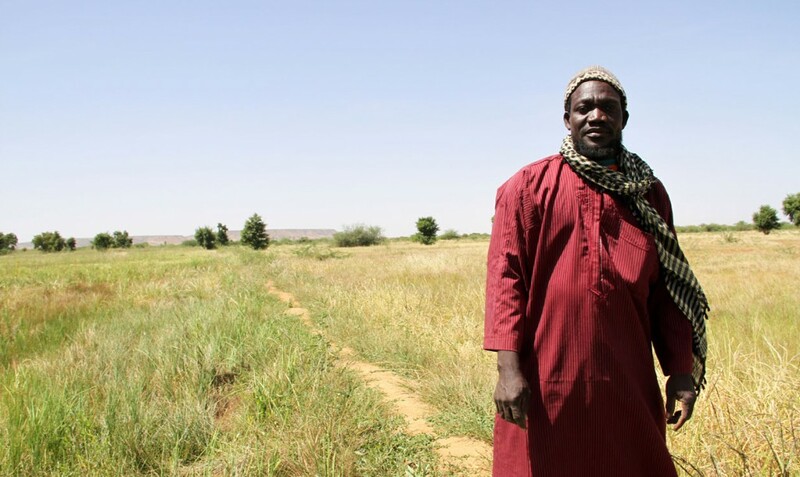 Climate change is exacerbating already challenging environmental conditions in Sahelian communities who overwhelmingly depend upon agriculture and natural resources to sustain their livelihoods. Women, girls, and other vulnerable and marginalized populations – who often lack a sufficient voice in decisions that affect their wellbeing – are at heightened risk of falling deeper into poverty as temperatures rise and rainfall grows more variable across the region. International climate finance is increasingly available to assist developing countries in mitigating the impacts of climate change. However, climate adaptation funds in Mali and Senegal are presently channeled directly to national authorities or to non-governmental organizations (NGOs) even though it is local governments who hold primary authority over natural resources management and adaptation. The status quo is problematic for three reasons. First, delays in drawing down climate funds from the national level prevent local governments from quickly and effectively responding to their citizens’ needs at the onset of a crisis. Second, nationally driven strategies often fail to recognize and factor existing community adaptive strategies developed over time through trial and error into their action plans. Finally, investments in strategies that do not align with local priorities may serve to undermine existing resilience strategies. 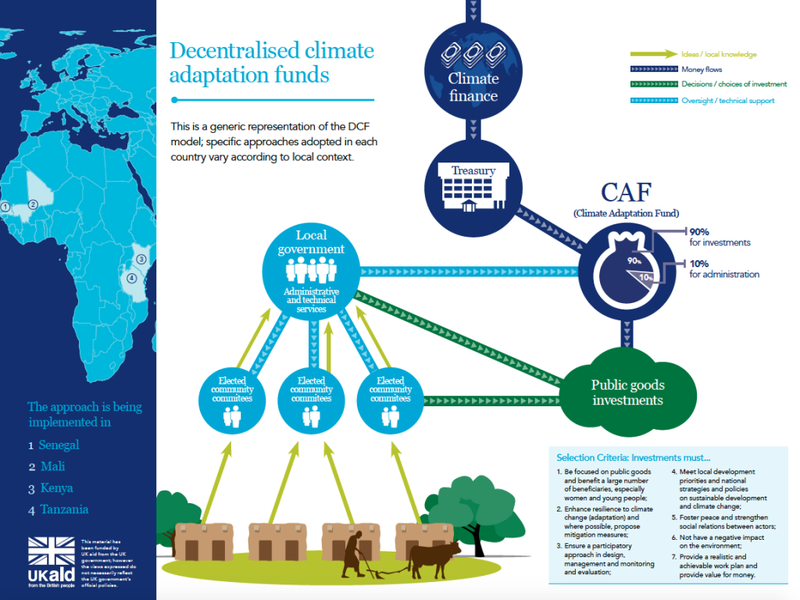 Ongoing processes of decentralization in Mali and Senegal provide a structure of local governance that can be built upon to ensure that control over decision-making and access to climate funds sits with those most directly affected by and best able to identify strategies for building local resilience to climate change. The project will help catalyze decentralized control over climate funds through the development of Climate Adaptation Funds (CAFs) and inclusive planning processes. It will test the evidence that local control can and does work while encouraging national policymakers to take local adaptation strategies into account in formulating development policy. Click here for infographics in French and for infographics specifically on Mali and Senegal. Local climate adaptation funds. Local governments will be given discretionary authority over a devolved Climate Adaptation Fund (CAF) with an initial value of £500,000 (445 million FCFA) per fund. The CAFs will be managed in a transparent, accountable, and cost-effective manner that is consistent with public finance policy and complementary to local governments’ existing budgets. In the future, local governments will be able to utilize the CAFs to draw down and manage climate finance from national climate funds and other sources of climate funding. Community-prioritized investments. The CAFs will finance locally prioritized, public good investments identified through inclusive community consultations that ensure differentiated representation of vulnerable individuals. Committees for Adaptation Planning (CAPs) established at the department level in Senegal and at the commune level in Mali will select the most impactful projects on the basis of a pre-defined set of criteria, and implement these using a public procurement process that builds the capacity of local governments, civil society organizations and the private sector to manage construction and operation of public good investments. Evidence and learning. The project will establish and institutionalize information systems and monitoring frameworks, including the Tracking Adaptation and Measuring Development (TAMD) methodology, to assess how climate change adaptation and development investments can strengthen local people’s resilience to climate extremes (differentiated by gender, age, wealth). Lessons drawn from the implementation of this project will be gathered, published and widely disseminated through digital platforms and networks of international and national practitioners and policy makers. Engagement with policymakers. NEF project will build relationships with relevant national and international institutions and decision-makers to share findings from the project. Policymakers will serve on a national-level advisory committee in each country to provide input to the project on an ongoing basis. Lessons will also be shared between stakeholders in the two countries as the activities are implemented. The project will seek follow-on funding for these local funds from the Green Climate Fund (GCF) and other development partners. Project activities are implemented in three Cercles in the Mopti Region in Mali (Koro, Douentza, and Mopti) and in four Départements in the Kaffrine Region of Senegal (Koungheul, Kaffrine, Birkilane and Malème Hodar). Learn more and read stories of resilience by visiting the BRACED Resilience Exchange.